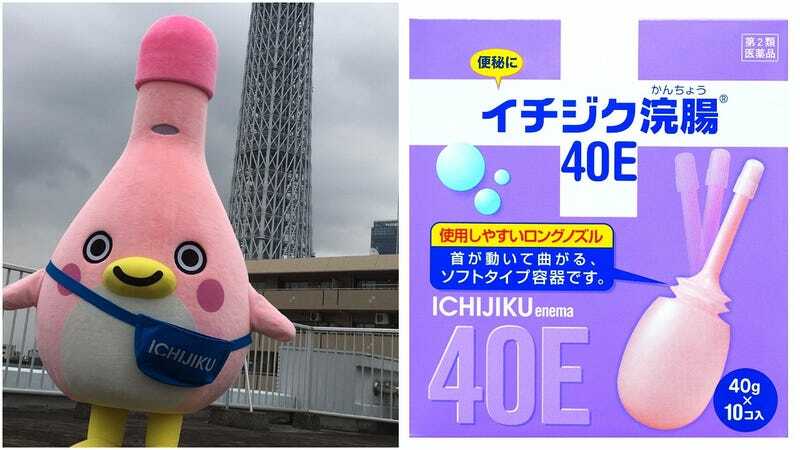 According to NicoNico News, Ichijiku Pharmaceutical created the character in 2016, designing it after its home enema kits. The character’s name “Kan-chan” is a pun on the word “kanchou” (浣腸). The character is now introducing itself on Twitter and will be going around to different places. The word “kanchou” might be familiar to some English speakers, because in Japan, it’s an infamous childhood prank in which you ram your index fingers into an unsuspecting person’s backside. Here, enjoy some enema kit fan art. You’re welcome! As you can see in the photo below from website Kakeibo Mama, a Kan-chan plush toy version exists. Of course, this isn’t sold in stores or anything like that. Rather, it’s used in promotional displays. This isn’t the first time that Ichijiku Pharmaceutical has tried making enemas cute. This old advertising featured cute, colorful whales, which hopefully remind you of taking a dump. Little kids, especially infants and toddlers, often get constipated, so an adorable character might make sense. But this is equally aimed at adults, who might also need some relief.